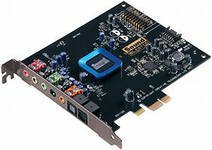 Creative Sound Blaster Recon3D Professional Audio is the sound card provides hardware acceleration for the game sound. Is controlled by the four-nuclear processor Sound Core3D which provides a good sound games on the PC. And audio technology THX TruStudio Pro provides surround sound.